Physical characteristics: Laysan albatrosses have a wingspan of 6.4 to 6.7 feet (1.95 to 2.03 meters) and weigh 5.3 to 9.0 pounds (2.4 to 4.1 kilograms). They are white in color with black patches at the wrist and elbow. There is a gray patch around the eyes and cheeks. The bill is yellowish orange at the base and fades into pink with a black tip. Geographic range: Laysan albatrosses live almost exclusively in the Hawaiian Islands. Smaller populations live on the Bonin Islands in the west Pacific Ocean and in the eastern Pacific at Islas Guadalupe, Benedicto, and Clarion. 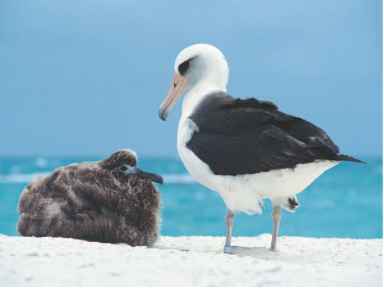 Habitat: Laysan albatrosses spend most of their time on the water, moving onto land only to breed. Diet: Squid is the main staple of the Laysan albatrosses' diet, but they also eat fish eggs, fish, and crustaceans, marine life having no backbone. They are not known to follow fishing vessels as is the habit of other albatross species. Behavior and reproduction: Laysan albatrosses have a wider range of displays than other albatrosses, and their communicative sounds have are distinct from those of other families. The nest is a hole in the ground that is built up around the rim using sand and other available debris. They lay one egg between the end of November and the end of December. 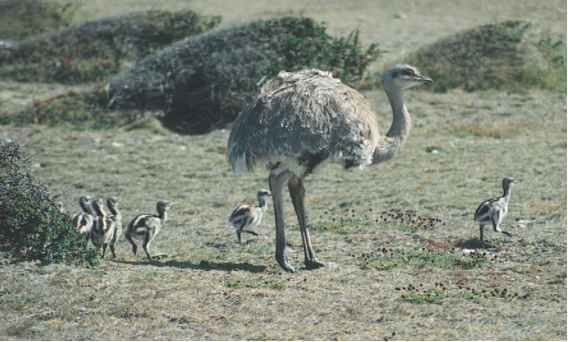 Incubation lasts an average of sixty-four days, with parents taking turns, sometimes up to three weeks at a time. Laysan albatrosses and people: The Laysan albatross is nicknamed the "gooney" and is a common sight in the countries surrounding the north Pacific Ocean. Johnson, Sylvia A., and Frans Lanting. Albatrosses of Midway Island. Minneapolis: Lerner Publishing, 1990. Safina, Carl. Eye of the Albatross: Visions of Hope and Survival. New York: Henry Holt and Company, 2003. Ramsayer, K. "Fossils of Flyers: Bones Tell Why Atlantic Albatross Disappeared." Science News (October 18, 2003): 244. "The Albatross Project." Wake Forest University. http://www.wfu.edu/ albatross/ (accessed on May 13, 2004).